as together we prepare for Emmanuel (God with us)! of people and churches resisting the cultural Christmas narrative of consumption by choosing a revolutionary Christmas through Worshipping Fully, Spending Less, Giving More and Loving All. both during the worship hour and the Faith Conversation hour. We know what you’re thinking. “Wait, didn’t they just say I should spend less, and yet here they are telling me to give more? What gives?” The most powerful, memorable gift you can give to someone else is yourself. And nobody modeled this more than Jesus. So what does this look like for you? Tickets to a ball game or the theater? A movie night? The main point is simple: When it comes to spending time with those you love, it’s all about quality, not quantity. It all boils down to love. Love from a savior. Love to a neighbor in need. By spending just a little less on gifts we free up our resources to love as Jesus loves by giving to those who really need help. 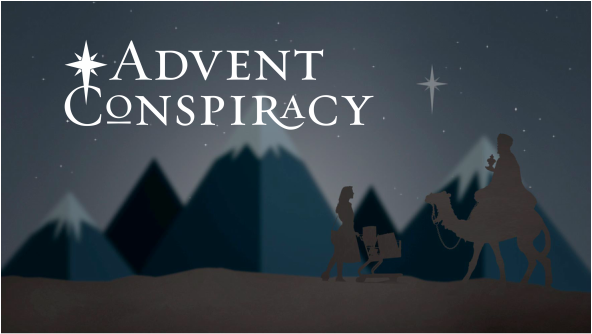 This is the conspiracy three churches began a few years ago, and has since grown to an international movement where thousands of churches have raised millions of dollars to love others in life-changing ways. It’s not that there’s something wrong with the shopping mall—it’s that the better story is about loving all.